There are two kinds of computer junkies in the world when it comes to cases. First there are those of you who are perfectly content to cram as much gear as is humanly possible into a tiny, little, puny case with metal so flabby that it would buckle if you ever leaned on it. Then, there are those of you with killer computing systems who invest in one of the most popular cases out there - the HX08 - and enjoy all the benefits of what a 23" tall case has to offer. Aside from the sheer volume of space this case contains, the HX08 is also one of the most modded cases out there. Drill it full of 6" blow holes, paint it black, shoot it with a shot gun for effect, pack in twenty different cooling fans, or simply leave it the way it is. Whatever you can throw at it, the HX08 seems to be able to take it. So, let's move onward and take a close look at several of the features that make this such a damn fine computer case! Comes with: rear IO guards, power cable, bag of assorted screws. First, the obligatory specs. If you're thinking desktop computer think again. 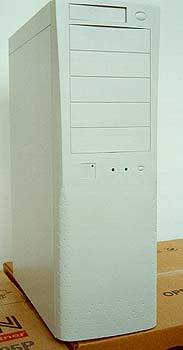 At 23" tall, 16" deep, and just under 8" in width this is a very big case. Depending on your desk, you may even have trouble fitting it under there. It's also quite a hefty piece of steel, weighing in at about 30 pounds - and that's empty.